Leaner Next Week: 25 Diet Directives! No need to dive right into the nutrition deep end. These 25 tips will provide simple suggestions so you can ease into those big lifestyle changes! Besides getting yourself off the couch and into the gym, nutrition is the most difficult aspect of fitness. You'll read and hear things like carbohydrates, high-protein diet, bulking, cutting, energy systems, and macronutrient ratio. Don't panic. There are a lot of small changes you can make that have major payoffs. With the right tools, you won't get lost in a vortex of complex language and diet protocols. These 25 tips, for example, are simple, sustainable, and definitely doable. Although you'll have to spend a little more time considering your nutrition, you won't have to do an entire lifestyle overhaul. These tricks can fit into anybody's health and fitness regimen and will make an enormous difference. If you don't get around to reading the other tips, remember this: Creating better eating habits should be a lifestyle change, not a temporary switch. Find a nutrition plan that works for you and your goals, and stick with it. Your body will be healthier and leaner when you can maintain a clean diet for a long period of time. Don't try the newest crash-diet trend. 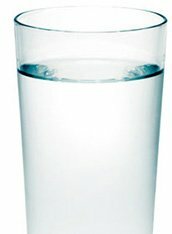 Before eating, drink a glass of water to make sure it's hunger and not thirst that you're feeling. It's also important that you aren't eating out of boredom or emotion. Just because you're watching television doesn't mean you need a bag of chips to keep you company. If it's not an everyday occurrence, having a sweet or salty snack doesn't have to come with a pile of guilt. Schedule cheat meals! Try the 90/10 rule: Eat clean 90 percent of the time, and indulge 10 percent. You don't have to be absolutely perfect to see success. Eat as many single-ingredient foods as possible. 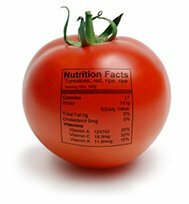 If a food has an ingredient list as long as War and Peace then it is probably highly processed and shouldn't go into your body. Sugar is sneaky. It can pop up in condiments, bran cereals, even bread. Sugar is fine in moderation, especially if it's coming from fruits like berries, but watch for ingredients like glucose, fructose, honey, dextrose, maltodextrin, and maple syrup. Even artificial sweeteners, though calorie-free, can make you crave sweets. If you're trying to make big changes in your physique, it's time to ditch that Milky Way mocha thing you drink every morning. We often forget to count those drinkable calories—which is a dangerous practice. Save for those protein shakes, drinking liquid calories will just make you consume more than you should. 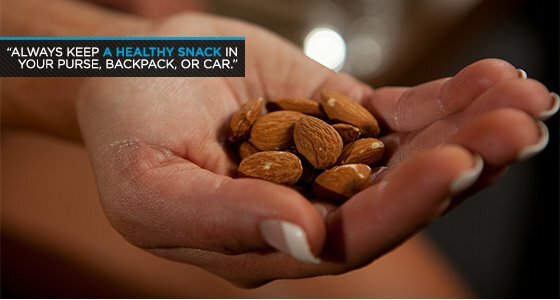 Always keep a healthy snack in your purse, backpack, or car. That way, you're prepared to feed your body healthy food instead of a Twix or a bag of Lays. Pack a handful of nuts, a scoop of protein powder, low-sodium jerky, veggies, or a protein bar so you have good sustenance with you when hunger strikes and you're out of the house. Save yourself time by cooking in bulk or slow-cooking meals. By preparing your meals early or saving leftovers for the next day, you'll more successfully stick to a healthy meal plan. It's also a good idea to sit and have an actual meal instead of nibbling all day long. It's too easy to lose track of calories when you try to multitask or eat while you cook. Before you head to a get-together or party, have a light meal beforehand. If you're not hungry, you'll be less likely to binge on foods that aren't part of your clean diet. Vacations and holidays are trickier. Plan for one indulgence meal per day, and try to eat light the rest of the day. Allow yourself some freedom to eat what you want, but keep it under control. When dining out, don't be afraid to ask for substitutions. A few small changes can easily slash 300 to 500 excess calories. Pay attention to how food is cooked, and if you're unsure about any ingredients in the dish, ask your server. They're there to help you. An odd drink here or there isn't going to ruin your diet, but regular drinking will just add too many empty, unnecessary calories. If you are going to drink, choose a drink prepared with a low-calorie mixer such as diet soda, or have a glass of wine. Don't avoid fat entirely. Fat is just as crucial to a balanced diet as proteins and carbs are. It provides energy, protects organs, and helps the body absorb nutrients. Saturated fat is also necessary for weightlifters, especially to help maintain proper levels of testosterone in the body. Fat-free is not synonymous with healthy. Often "fat free" is code for "full of sugar." How else is fat-free yogurt going to taste delicious? For muscle gains and fat loss, you need to eat protein. Try to get at least 1 gram of protein per pound of bodyweight. 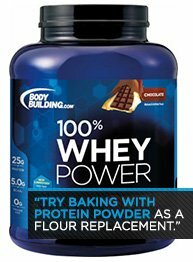 If drinking protein shakes takes an immense amount of willpower, try baking with protein powder as a flour replacement. An easy way to increase the nutritional value of your food is to make simple, smart substitutions. For example, go for ground turkey or bison rather than ground beef, Greek yogurt instead of sour cream, coconut oil instead of vegetable oil, coconut flour instead of regular flour, and green tea or black coffee instead of sugary morning beverages. Cinnamon is the unsung champion of your diet. It can help maintain healthy blood glucose levels, stabilize energy levels, and curb those hunger-causing insulin crashes. Add it to oatmeal, baked goods, or even your morning cup of Joe. A few tablespoons of ground flaxseed go a long way. It's high in fiber, provides omega fats, vitamins, minerals and a small dose of protein. Add it to protein shakes, yogurt, or baked goods. 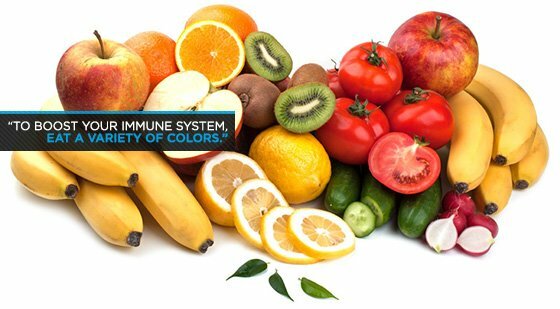 To boost your immune system, eat a variety of colors: mangoes, papayas, oranges, bell peppers, squash, tomatoes, etc. Brightly colored fruits and vegetables are rich in vitamins, minerals, and antioxidants. Don't be so quick to toss the yolk from your eggs. Though you might have to account for a few extra calories, its high-nutrient value is well-worth it. Fish is a great source of omega-3 fatty acids which enhance brain health, improve insulin sensitivity, and strengthen the immune system. It's surprising how many people have symptoms of gluten intolerance and don't even realize it. If you have tummy issues, hold off on grains and flour. You might just feel better. Casein protein with a healthy fat is a great pre-bed meal. The slow-digesting protein will release a steady stream of amino acids to your muscles throughout the night. Fueling your body correctly before, during, and after your workouts will enhance performance and foster faster recovery. Even if you're in the market for fat loss, getting some protein and carbs to your muscles before and after your workout will pay big dividends. I know, trying to remember 25 tips is a big challenge, especially if you're new to fitness. The main goal is to keep it simple. Eat the proper amounts of wholesome, natural food. Soon enough, you'll look and feel your best.